And what became clear to me in that infinite moment is that, ironically, a man with cancer has more options than one that doesn’t. Having already stared my own mortality in the face, I couldn’t really be threatened with death. What a pleasure to find a new author to follow, and a new series to pick up! And the Kindle prices are reduced right now! 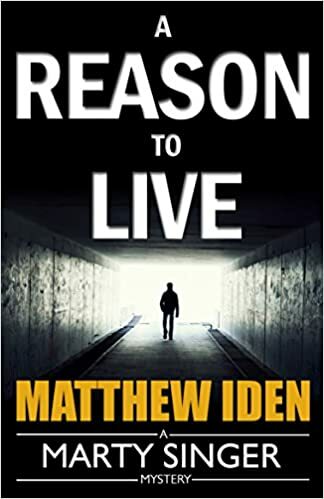 A Reason to Live by Matthew Iden is the story of Marty Singer (also the narrator), a detective for the Washington D.C. police department, retired. He didn’t retire willingly. He felt obligated leave the job to when he learned that he had colon cancer and was in for a course of chemotherapy. He’s middle-aged, divorced, and has no very close friends. Life seems bleak, hardly worth the trouble of fighting his disease. Then he’s approached by a young graduate student named Amanda Lane. Marty remembers her, all too well, as the daughter of a woman who, years ago, was killed by a uniformed cop who was also a stalker. Marty worked hard to put the creep away, but somehow the case fell apart and the perpetrator walked. Numerous fingers pointed blame in every direction, and Marty came in for his share. He’s felt bad about it ever since. Amanda has tried to put the past behind her, but now she’s convinced the killer has returned – for her. He used to leave cheap carnations when he showed up, and now she’s started getting the same floral gifts. Marty doesn’t need an unauthorized private investigation in his life just now… and yet that’s exactly what he needs. Suddenly he has someone he cares about more than himself, something other than his own disease to think about, and a new reason to go on. Well written, vividly characterized, A Reason to Live is an excellent mystery in the hard-boiled vein. Highly recommended. Cautions for language and mild sexual situations.